Doctor Who: Remembering THE INVASION OF TIME | Warped Factor - Words in the Key of Geek. Tony Fyler cuts a six-parter down to size. The Invasion of Time is one of those curious, courageous things – a six-part Doctor Who story. Some of the best stories in the show’s early history were six-parters – from The Dalek Invasion of Earth through Power of the Daleks and Web of Fear, to The Sea Devils and The Green Death, to Genesis of the Daleks, The Seeds of Doom and The Talons of Weng-Chiang. Then there are those other six-parters: the ones that make you scratch your head and think ‘Really? They needed nearly three hours to do this?’ – The Chase, The Space Pirates, The Mutants, The Armageddon Factor and so on. So where does The Invasion of Time sit in the pantheon of the six-part stories? Well, really speaking, it’s a story that starts at the height of its powers, and bowls along reaching a series of peaks through its first four episodes…only to really rather fall to bits once the main villains of the piece arrive. At the start of the story, Tom Baker is in barnstorming form, as a Doctor as capricious, angry and unpredictable as anything Colin Baker or (so far) Peter Capaldi ever tried to do in the role, but Baker makes it look effortless – he’s distant to Leela, arrogant with Borusa and generally, he struts around Gallifrey with the air of a semi-psychotic dictator – it’s Baker as Caligula, with a touch of Tiberian melancholy thrown in to balance the performance. When he is invested with the power of the President of Gallifrey, he is vacant, absent, the price of his betrayal seeming heavy on his mind and face. When the Vardans arrive, Baker is stunningly cruel, his laughter convincing the unwary viewer that their dear Doctor really has gone stark raving mad after all, and as he goes through the episodes and his real purpose is revealed – luring the Vardans to reveal themselves so he can time-loop their planet and halt the invasion, we see a Doctor increasingly desperate and potentially on the verge of a nervous breakdown as he disables one barrier after another to allow the invaders to feel secure. Baker though doesn’t operate in a vacuum for these first four episodes – we get to see the nature of Leela’s faith in her Doctor, believing and declaring that he has a plan when others think he’s a traitor to all of Gallifrey. John Arnatt as Chancellor Borusa gives a layered performance that shows both the twinkle that might have inspired the Doctor, and the hard-as-nails politician edging his way toward the Presidency himself. Milton Johns as Castellan Kelner delivers a particularly fine performance as the smooth, clever chief guard who is completely unprepared for anything to really threaten his world, and falls into subservience when his cosy reality is shattered beyond measure. Things begin to degenerate only when the Vardans relax their guard and go, in half a heartbeat, from weird shimmery alien overlords who can travel on radio waves and read thoughts to a handful of the kind of tin-helmeted spotty blokes who have clearly never had a date. Even the Doctor grins at their disappointing reality (a dangerous game, this – presenting something naff and then having the hero point out how truly naff it is), and Bernice Summerfield would famously later deride the Vardans as being the only species in history to be foiled by the intellectual might of the Sontarans. They simply go from credible villains to a bunch of sad gits far too quickly, and after that, their defeat seems inescapable. Except of course it comes too early. It comes at the end of Episode Four – pretty much where you’d expect it to be in a four-part story. The truth, unfortunately, is that it probably should have ended there. Yes, when they were revealed, the Vardans were naff, but the level of the performances throughout the first four parts is high enough to have made The Invasion of Time a tense, thrilling four-parter. It’s true, the end of Episode Four is brilliantly realised – the triumph of the Doctor undercut beautifully by the unexpected arrival of a handful of Sontarans – but from the moment of their arrival, The Invasion of Time begins to look flabby and overstuffed…much like the Sontarans themselves. Almost everything about Derek Steadman’s performance as Commander Stor seems odd to anyone who had watched Sontarans as played by Kevin Lindsay in The Time Warrior and The Sontaran Experiment – the build, the head (which rather looks as though Stor has been in a fight just before arriving on Gallifrey and has the black eyes and bruises to prove it), the costume, which looks let out and cheaply helmeted, and the weird hissy delivery of ‘Dok-torrrr.’ You wonder if he’s the product of a very much weirder clone batch than any Sontaran you’ve seen up to that point (an idea that was sadly to recur with the towering Sontarans in The Two Doctors). And while the Doctor feels dramatically in control all the way through the Vardan story, as soon as the Sontarans arrive, he seems determined to run away, going further and further into the Tardis, in padding scenes probably rightly criticised for their repetitive use of the same film locations. The conclusions of the storylines are equally tonally odd when looked at in the overall canon of Who. Having secured the Great Key of Rassilon, the Doctor instructs K9 and faintly pathetic Time Lady Rodan to build not only a gun, but a thoroughly forbidden gun at that – the De-Mat Gun, with which to eliminate Stor from time altogether. There’s a certain logic in using a gun against a force as militaristic as the Sontarans of course, but it rather feels as though it’s his own mistakes the Doctor is trying to erase from history. And then of course, there’s Leela. 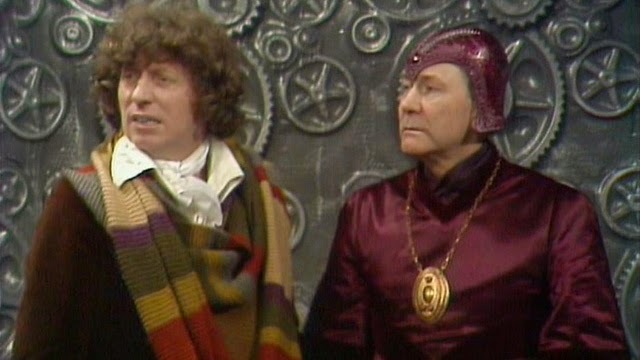 You have to really, badly want to see the character logic in Leela staying behind on Gallifrey to marry, of all people, the rather pompous guard-turned-revolutionary, Andred. 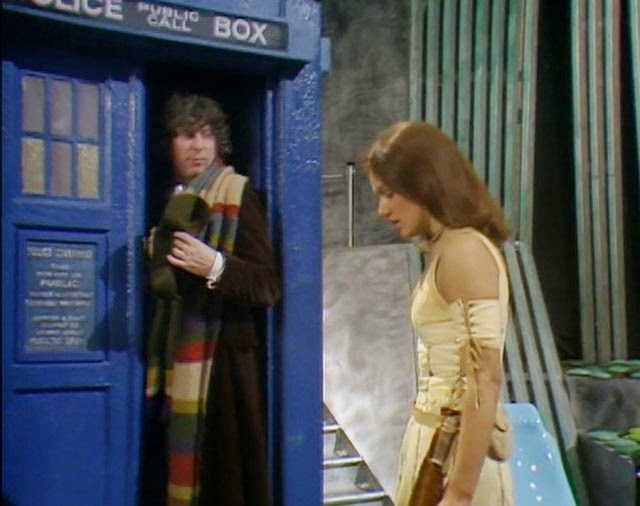 Given that she’s been introduced to the Shobogans – one-time Time Lords who have gone back to a more primitive way of living outside the Citadel – it begins to seem inconceivable that it’s Andred who has caught Leela’s savage eye. We can say she’s grown up and feels that the Doctor no longer needs her to look after him, while Andred needs someone to introduce some fire into his belly, but it all feels like what it almost certainly was – hopes and plans from the Production Team to change Louise Jameson’s mind about staying on for another season ultimately coming to nothing, and a resolution being found which made human sense, if not any particular sense within the characterisation of Leela. 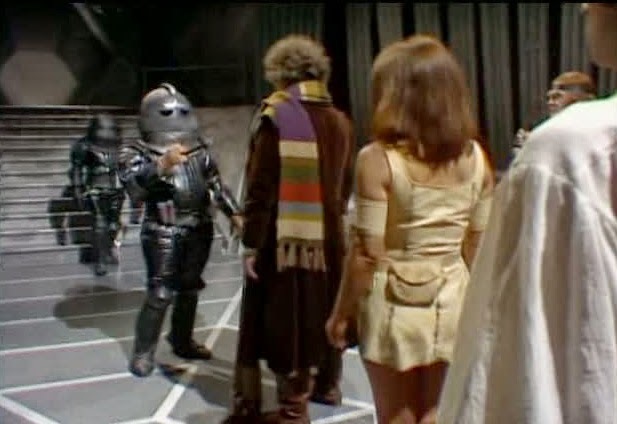 Ultimately then, The Invasion of Time is a good solid four-parter, with two additional episodes of vaguely pointless running around tacked onto the end. But what is crucial is that for most of those first four episodes, Tom Baker is unassailable – brutal, brilliant, loud and arrogant, while, when free to reveal himself, also showing intelligence, humour, sarcasm and wit. It’s the Baker performance that powers the viewer through at least those first four episodes of bizarre Gallifreyan architecture, Time Lords in funny hats, shimmering tin-foil aliens who become irritating, tin-helmeted aliens, and all the rest of the storytelling oddness. Through it all, Baker is supremely manifested as the Fourth Doctor. If you’re going to watch it again, you might consider switching off after the end of Episode Four, and ignoring the arrival of the Sontarans altogether. As a tight four-parter, Baker’s performance elevates the first two-thirds of The Invasion of Time to something truly special. As a flabby six-parter, it’s Baker’s powerhouse interpretation of the vagabond Time Lord that manages to redeem a story that goes badly astray and crashes into the wall at the end.